Performers include: Lassie, Dee Wallace Stone, Chris Stone, Megan Fox, Will Nipper, and Jon Provost. In this low-budget syndicated series, Lassie lives with the McCullough family in Glen Ridge, California. The father, Chris (Christopher Stone), is a struggling architect and building contractor. He’s married to Dee (Dee Wallace Stone), a homemaker, and together, they have two children. 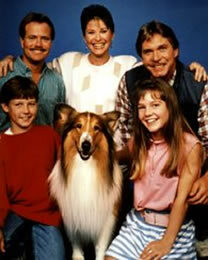 Megan (Wendy Cox) is a sensible 14 year old teenager while Will (Will Nipper) is the 10 year old owner of Lassie. Chris’ brother, Steve (Jon Provost), is a local real estate agent who rescued Lassie as a pup and gave her to his nephew. In the first episode, Steve is accidentally shot by a deer hunter out of season. The law breaker then proceeds to claim that Lassie bit him so that the dog can’t lead help to Steve. Later plotlines include Lassie being trapped in a hot car, Megan becoming sick from a polluted late, the dangers of Halloween pranks, fallen power lines, buried Indian treasure, and Will wanting to sell one of Lassie’s pups so that he can buy a new bike. While storylines seem quite tame and politically-correct when compared to those of the original series, one thing remains the same. Lassie is always around to help save the day. Professor Jeff Miller (Tom Rettig) is a computer scientist who’s testing dogs for their mental abilities. Young Will wants Lassie to be tested. First aired: March 7, 1992. The character of Lassie has appeared in several other TV series but none of them have been related to this version. • Rettig played Lassie’s first owner, Jeff Miller, on the original Lassie series. This marked the first and only time that the actor appeared in a Lassie project since leaving in 1957. Rettig also co-wrote the episode and a flashback of the original series was used. • Provost played Lassie’s owner Timmy Martin in the original Lassie TV show. He played a different character in this series but, in the seventh episode, the producers awkwardly reveal that Uncle Steve was actually Timmy all grown up. June Lockhart, Timmy’s mother, also appears in the episode. Unfortunately, the history doesn’t match up with the old series and it ends up not making much sense. • In later years, Will Nipper began using his middle name as his showbiz last name. As Will Estes, he’s appeared on shows like Reunion and American Dreams. • A young Leonardo DiCaprio plays Will’s friend in some episodes. • The actors who play the parents, Chris Stone and Dee Wallace Stone, are married in real life as well. • Roddy McDowall, who played Lassie’s owner in the character’s early movies, appears in three episodes of this series. He plays author Andrew Leeds, a character that’s reminiscent of Lassie’s creator, Eric Knight. You couldn’t have been a true Lassie follower because the old series history did match up and the ending was great! Is there a dvd of the new lassie, with Will Nipper? ?